However, these samosas were much tastier and not at all greasy like I generally find they are at restaurants. @michpetersjones said that most restaurant samosas are greasy due to the fact that they have to be prepared and fried in advance, then are fried once again in order to reheat them prior to being served to the diner, resulting in a samosa that has absorbed much more oil than those fried only once. Below you’ll find @michpetersjones recipe for the filling and dough for samosas. 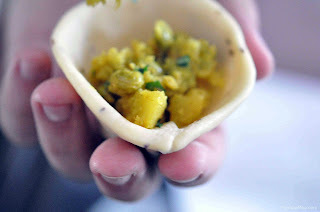 As well as how to construct ragda samosa chaat, a street dish in India, which consists of a samosa, ragda and a few other ingredients resulting in a dish with contrasting textures that work wonderfully together and is mildly spicy, slightly sweet, a hint acidic, and a bit tangy all at once. Least to say, I won’t be looking at samosas the same way ever again knowing the work that goes into it! 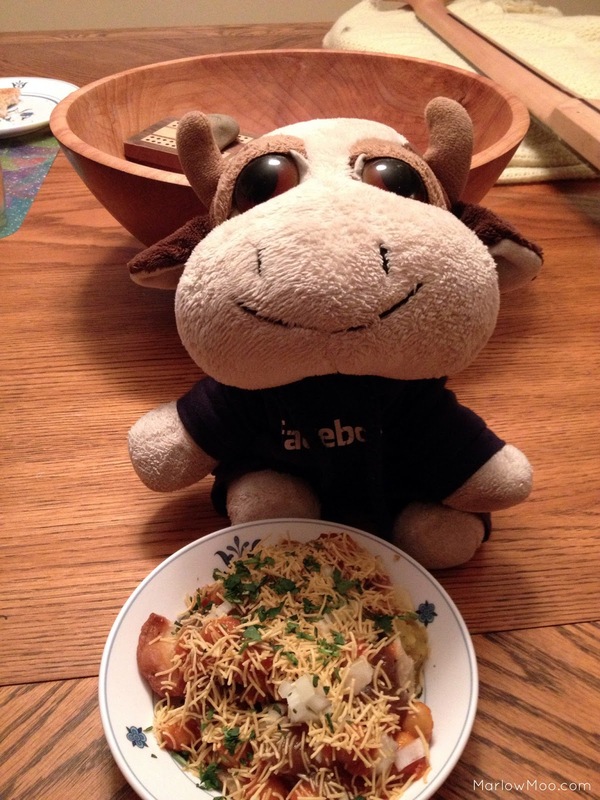 But a great time was had by all of us learning how to make samosas! We (@MarlowMoo, @caldwellcreates, @KevinEdsonJones) were perhaps not the best students, with @caldwellcreates trying to artistically create samosas that looked like spaceships and stingrays, and @KevinEdsonJones making samosas that wound up becoming floaters under @caldwellcreates tutelage, but at least we enjoyed our creations! For more tasty Indian recipes check out @michpetersjones blog, The Tiffin Box. Or sign up for an Indian Cooking class taught by Kathryn Joel and @michpetersjones at Get Cooking Edmonton. Check out my photos on PhotoBucket for a pictorial step by step. Update May 14, 2013 - Check out @michpetersjones post about samosas on The Tiffin Box. 1. Heat 3 tablespoons unscented oil in a frying pan on medium heat. 2. Add ½ teaspoon of cumin seeds to the oil. 3. After 30 seconds when the cumin begins to sizzle, add ½ medium diced onion and fry for 5 minutes until they are softened. 4. Add ½ inch of chopped ginger, 1 green chili finely chopped, and sauté for 30 seconds. 5. Add ½ teaspoon of tumeric, ¼ teaspoon of dry mango powder, 1 teaspoon of cumin and ¼ teaspoon of garam masala and sauté for 1 minute. 6. Add 2 large chopped potatoes and fry until they just begin to soften, and then turn down the heat to low. Do not preboil the potatoes, they will be more flavorful when cooked with the spices. 7. Add 1 cup of water, ½ cup of peas, the juice of ½ a lemon and salt to taste. 8. Cook on low heat until the potatoes are tender. The potatoes need to be fully cooked because they will be roughly mashed once they are cool. 9. Once cooked, turn off the heat. 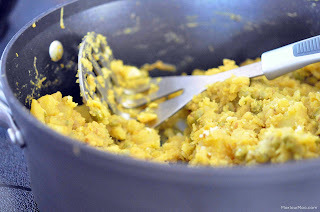 Add large handful of chopped cilantro, mash potatoes roughly and allow the filling to cool to room temperature. 1. Mix 4 tablespoons unscented oil with 2 cups ‘00’ flour, 1 teaspoon ajwain, ¼ teaspoon baking powder, and 1 ½ teaspoon salt until the mixture has a crumbly consistency – similar to making biscuits or pie dough. 2. Add warm water, a little at a time, until the dough comes together and is soft and pliable. 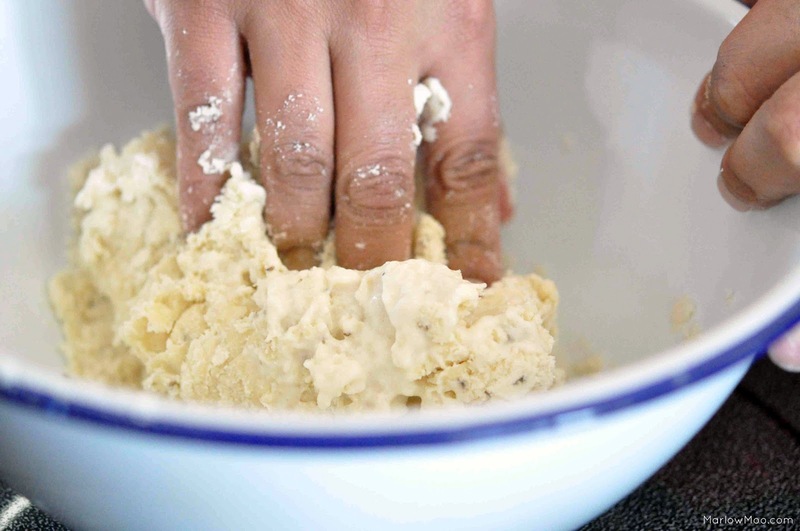 You know the dough is a good dough if your hands are clean once you are done kneading it. 3. Cover the dough with plastic wrap and allow to rest for 15 minutes. The dough will soften upon resting. 1. 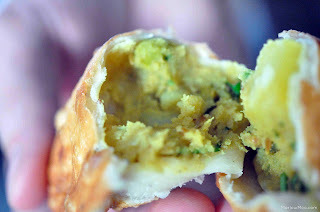 Pinch of a chunk of the dough, you should have enough for 10-15 samosas, and each chunk you pinch off will make 2 samosas. Keep the remainder of the dough wrapped in plastic wrap to keep it moist. 2. 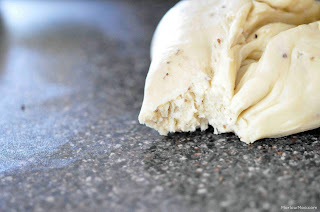 Roll out the chunk of dough into a very very thin oval. It should be so thin that it is practically translucent and you can see your counter top through it. 3. Cut the oval into two pieces horizontally. 4. Curve the cut side into a pouch. You can use water on the edge of the dough to help seal it. 5. 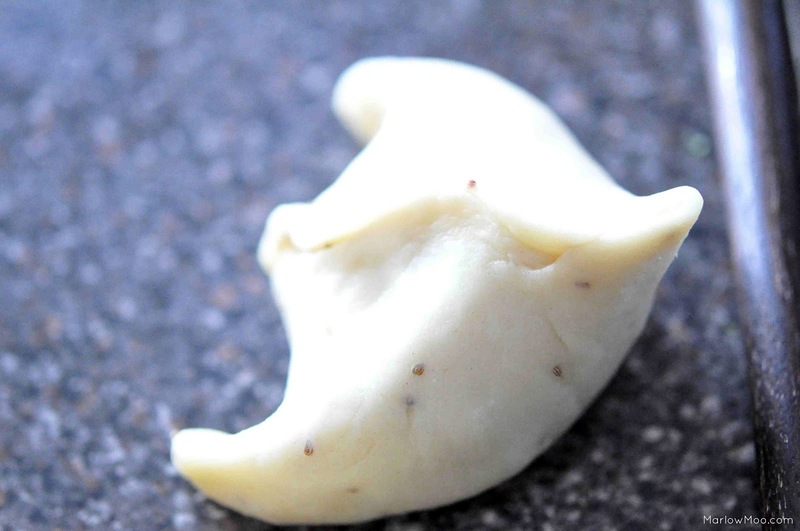 Fill with samosa filling, being careful to leave enough room to pinch it closed. 6. Fold the top flap over and seal while ensuring you are squeezing any air out of the samosa. Again, you can use water on the edge of the dough to help seal it. 7. 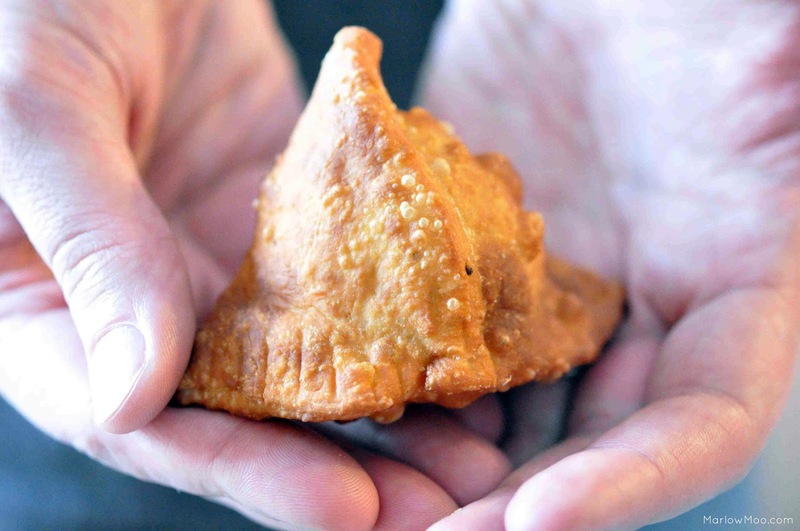 The finished samosa should be a triangle shape and it should be able to sit up on it’s own on one side. 9. Make and cook the samosas in small batches, approximately 4 at a time. Otherwise the dough will dry out and become glutinous. 1. Heat canola oil up in a pot to 350F. 2. 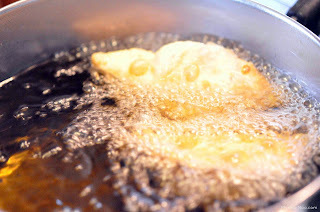 Gently lower the samosa into the oil and fry 2-3 minutes until golden brown. 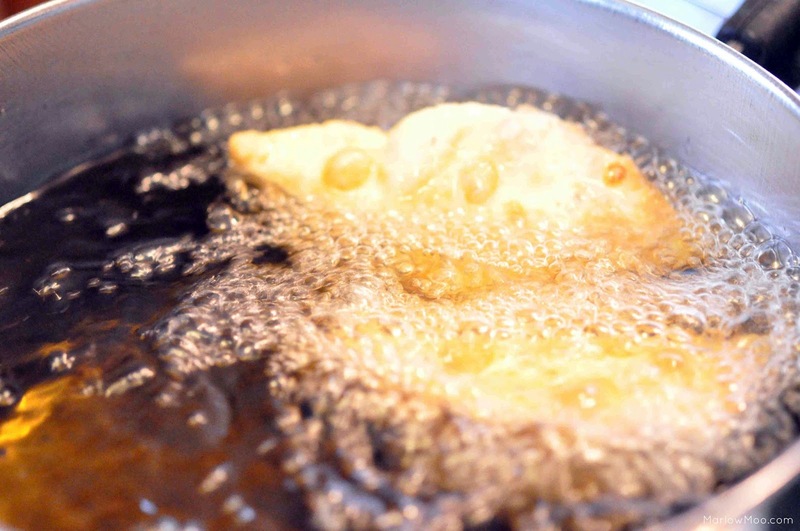 If the samosa floats, it has too much air in it and you will need to hold the samosa down in the oil with a long handled slotted spoon so that it can cook properly. 3. Once cooked, gently remove samosa from the oil with a long handled slotted spoon, draining off any excess oil. 4. Place cooked samosa on a plate with paper towel to help soak up any additional oil. Allow to cool. 5. The finished samosa should be bubbly and golden brown in color. 1. Break up the cooled samosa into pieces into a small bowl. 2. Add enough ragda to lightly cover the samosa pieces. 3. Add tamarind chutney, onions, yogurt, sev and chopped cilantro to taste.